Speak any message and iSpeech Dictation Pro™ will put it into text format. Send your BlackBerry Messenger (BBM), text (SMS), emails or voice notes by voice. 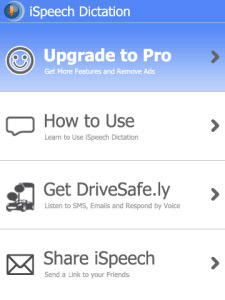 The app’s human-quality speech recognition is powered by iSpeech®, a leading speech provider for mobile developers and businesses, and the creator of the award-winning application, DriveSafe.ly®. Learn more at Linky v URL mohou vidět jen registrovaní uživatelé. Přihlaš se nebo registruj na fórum.. Speak any phrase or message and iSpeech Dictation Pro™ will translate it into text. Talk and type.